I’ve always loved little notebooks. I used to love buying just the “right” one and filling the first five pages with whatever that notebook was supposed to hold—to-do lists, journal entries, craft patterns, or doodles. I did not, however, love my embarrassing stash of pretty, abandoned notebooks that didn’t serve their intended purpose for very long. I also did not love the idea of locating and lugging around three or four notebooks at a time. So, I gave up on notebooks for a while. As life got more complicated in terms of work, health, and home, I realized that I desperately needed a notebook again. I’m not a person who can keep everything up in their head, and I get overwhelmed if I don’t take what’s in there and put it on paper. “Why not use your smartphone?” you might ask. I do—I just use it for very specific things, like scheduling appointments, sharing lists or documents, and a few apps. I like the feel of a paper notebook, though, and writing with pen and paper is faster for me than typing on a tiny phone screen. I also find my phone distracting—I might pick it up to jot something important down, then end up on Facebook or Reddit or animalssittingoncapybaras.tumblr.com for the next 20 minutes. I don’t remember exactly how I found out about the Bullet Journal method, but I ended up watching the tutorial video created by the Bullet Journal’s hip, Brooklyn-based creator whose official job is “digital product designer,” whatever that is. He developed his own method of making to-do lists and calendars in an all-in-one notebook, and a friend thought others might find it useful. All of my journals, from 2016-2018. I certainly did. And I’m not being sponsored or paid to say that. In fact, you don’t need any special product to use his method, just a pen or pencil and any notebook. Do I use every single one of these components? No. I eventually found which ones worked best for me, and stuck with them. It’s an easily customizable system that is meant to be streamlined, not burdensome. 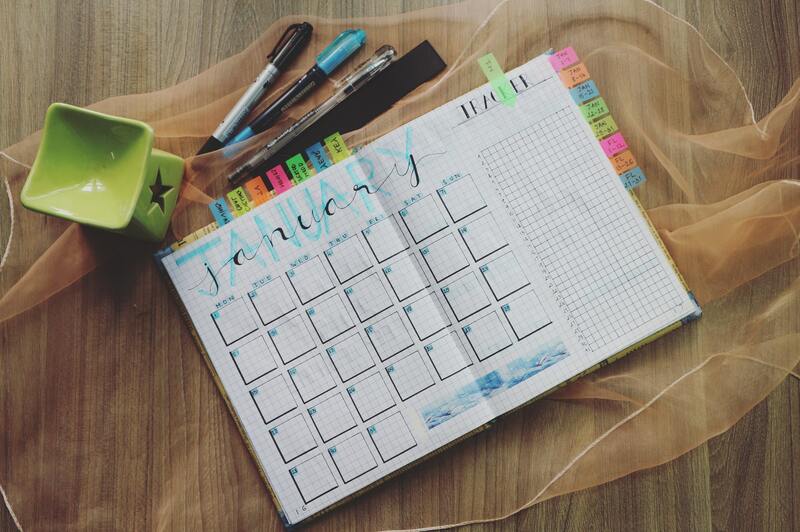 People have gotten pretty creative with Bullet Journals since their appearance five years ago. Some stick to the basics, while others turn theirs into daily, weekly, and monthly masterpieces of watercolor art and precisely-drawn charts. There are even guides to giving your own bullet journal some flair, and—of course—lists of products you can buy to accomplish this. I love colors and a good doodling session, so mine might fall into the “pretty” category, but I’m still using the colored pencils I’ve had since high school. One of my special sections interspersed with daily schedules. So, what is the most useful aspect of the Bullet Journal to me? Over time, I’ve realized that it’s the centralization of “all my things” in one notebook that makes it different and indispensable. It’s not the same as having a notebook with tabs or designated sections, either. Those don’t allow for much flexibility—if you fill up one section and the others are half-empty, what do you do then? What if you have something that doesn’t quite fit in any category? In my Bullet Journal planner, daily to-do lists might be right next to a crochet pattern I’m writing, or I might decide to create a list of birthdays and holidays near the front of the notebook that I can always refer to. Once I’ve got the “basics” in the front (an index, maybe a yearly calendar), everything else flows from there. Making charts is almost a form of meditation for me. Especially when they’re nature-related! In a weird way, it’s the anti-perfectionist’s planner or journal. Everything is all jumbled into one notebook, but that’s okay because you can just list each random page of notes or lists or doodles into the index in the front. Want to doodle on an entire page? Go for it. It’s both simple, organized, and totally flexible at the same time. This one little item—a habit, really—has given me a greater sense of coherence and wholeness in my life. You wouldn’t think a material object could do that, but it’s given me a place where my hobbies, work, home life, and thoughts can all exist and not feel fragmented. Plus, any excuse to color or doodle in the margins is worth it in my book! I’m a recent convert to Bullet Journalling. Like you, it’s the “all in on place” thing that I like the most. I used to have little lists everywhere. I also like the routine of sitting down and doing a double page spread for the week ahead. Mine does not look pretty, it’s very simple. I can see myself using and refining this system for years to come. It is a nice routine, isn’t it? And having everything in one place makes life so much simpler. Thanks for reading, and good luck with your Bullet Journaling!